Thisstory was updated at 5:33 p.m. EDT. NASA may appear to have its pick of thousands of known asteroidsfor a manned mission, but only two are good targets within the next 20 years. An asteroidmission requires a large-enough destination that astronauts could reachwithin a few months of launch from Earth, says Lindley Johnson, head of NASA'sNear-Earth Object program in Washington. Other limits to such an ambitiousundertaking include the viewing range of ground-based telescopes. "They don't come all that close all that often,"Johnson said at a NASA workshop on NEOs three weeks ago. While NASA admits more knowledge about objects that passwithin 28 million miles (45 million km) of Earth could increase the number of possibledestinations, only two currently meet the guidelines set out by the spaceagency in its attempt to send a mannedmission to an asteroid by 2025, a goal set by President Barack Obama. One ofthe asteroids could be reached in 2020 and the other in 2025. A third candidate would not be within range until 2045. NASA has not yet chosen any specific target for astronauts,Lindley said. It has simply begun examining its options under certain human spaceflightscenarios. The earliest NASA could expect to reach an asteroid would bein 2020, when ground-based telescopes are able to spot the return of a 197-foot(60-meter) rock known as 2009 OS5. Under one scenario, astronauts would launch on March 11,2020. The space explorers might even fly aboard partof the International Space Station, a node that could be converted and detached,according to a theoretical proposal in a separate NASA presentation. The round trip would take 170 days, which fits within NASAplanners' ideal guidelines of a spaceflight to and from the asteroid that lastsno longer than 180 days. 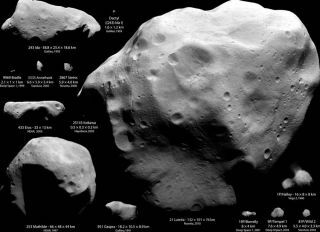 Another guideline is that the asteroids have a size ofat least 164 feet (50 meters). The March 2020 launch would come just shortly beforeEarth-based telescopes could survey the returning asteroid in April 2020. IfNASA missed that launch window, it could theoretically try again for the samespace rock in 2036, agency officials said. A launch opportunity to visit a different asteroid wouldarise Sept. 19, 2025, with astronauts aiming for another 64-foot space rock, called1999 AO10. But the viewing opportunity for Earth-based telescopes to spot thattarget would come several months later, in January 2026. A later effort could target the 328-foot (100-meter) objectcalled 2003 SM84 in 2045. The three possible candidates for the 2020-50 timeframe camefrom a larger list of 44 known objects in orbits reachable by a human mission. That assumes the future mission would have a rocket-launchcapability similar to the heavy-liftAres V rocket being developed under the Constellation program, but whichcould be canceled if President Barack Obama's proposal for NASA is approved byCongress. But just 17 of the objects reachable by humans are largerthan 164 feet, and only 15 are accessible within the next several decades. Ofthose 15, only three fit within the 180-day round-trip limit. The list of possible targets reachable by humans couldexpand with more-complete surveillance of NEOs. Experts agreed that NASA andits international partners need to invest in more ground telescopes, or in apossible space telescope that would roughly follow a Venus orbit. Better monitoring of space rocks also could provide more informationabout spin state, composition or possible neighboring objects. Even the threepossible targets reachable before 2050 remain largely unknown besides orbit andrough size.